OLYMPIA – A bill to help rebuild the Seattle-based North Pacific Fishing Fleet passed by a 97-1 vote in the Washington State House of Representatives on Thursday. HB 1154, sponsored by Rep. Gael Tarleton, D-Ballard, ensures the region’s competitiveness in maritime, fishing, and seafood process industries by providing temporary incentives to support the rebuild and replacement of aging fishing vessels. Rep. Gael Tarleton with Governor Inslee at the Maritime Blue kickoff. 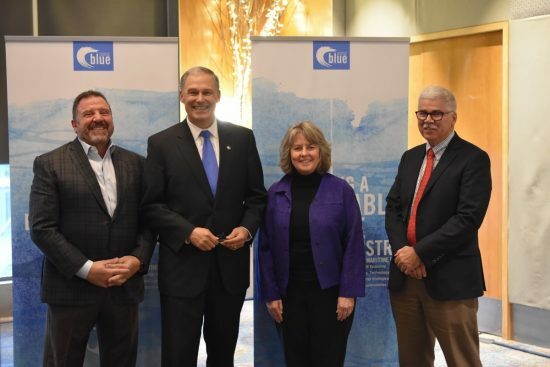 Furthermore, Rep. Tarleton serves as the co-chair of Governor Jay Inslee’s Washington Maritime Blue Task Force and Advisory Council, which has been tasked by the governor to accelerate robust, sustainable innovation in the maritime sector. This bill is the result of crucial federal legislation to save our fisheries, beginning with the Magnuson-Stevens Act in 1976 that stemmed the tide of overfishing and rebuilt our fish stocks through the creation of the Pacific Fishery Management Council. It was made possible by federal legislation in 2014 to provide financing for aging vessels. HB 1154 now heads to the Senate for consideration. You can follow the progress of this bill on Rep. Tarleton’s bill blog.